Emily shut her eyes tight and forced her tears not to run down her cheeks. Her mother stood there for a while breathing heavily through her nostrils with rage. Like a bull in the arena ready to rip the red cloth and then …she left. Emily quickly ran under her bed and took the letter in her hands. Her heart was still beating fast and her eyes burned. She unfolded the letter and started reading with shaking hands. “Last time I saw you, you told me in secret that I will forgive you one day, remember? I still remember your look, the way you carried yourself, striking and confident, ready to conquer the world with your unbeatable attitude. Well, you know what? I wished I could forgive you even though I knew that I would never will. “You know how feelings are… When they are there, they are all over you. They make you think …want, do and try the craziest, the silliest things. They make you forgive the unforgivable and forget the unforgettable. And then comes a day when they are gone. Just like that! They vanish in thin air. All of a sudden; just like they invaded your life taking all over your being. “I wish I could forgive you and as a matter of fact I believe I just did. There aren’t any feelings left inside me. Not for you, not for us together. I forgive you, I really do. You are free to go. “You know, love is like a big thick piece of glass that aims straight to your heart. When you first feel these spins in the stomach, when time seems to be endless and the waiting unbearable without your beloved one. That is when that piece of glass starts moving and nails your heart. “You fall deeply and even more deeply for the other; fully and unconditionally in love. You get together, share your thoughts, your feelings, your lives. Until it comes a day were clouds shade your sunny, bright blue sky. And you can hear the cracking. You could swear you heard that cracking in your heart. And for the first time you truly believe that a heart can really break. With a big, thick piece of glass inside that suddenly turns into thousands of small pieces, scattered all over it. “Do you know what these pieces are? They are pain. Clear, pure pain. Every time you get hurt by the person you breathe for a piece gets deeper and deeper in your heart until it disappears, leaving a black hole behind. It might take months, years, or weeks, even days. A single moment. But sooner or later all the pieces will disappear deep inside you, leaving black holes in a heart that looks more like a sponge …bleeding. It keeps bleeding, sucking everything out, till it drains you up. “You try to feel, you want to feel, you need to feel, you HAVE TO feel… But you feel nothing. All you have is an empty heart like a sack full of holes that can’t be filled with nothing but thin air. That’s how you left my heart. A dried sponge. “Goodbye my love. I’m sorry. I’m sorry not because I don’t miss you anymore, not because I don’t need you anymore, not because I feel nothing anymore, but because I know that soon I won’t even remember you. And that will make all the years I spent with you a total waste of time. “And I so hate wasting my time. Little Emily put the letter back in its envelope and hid it behind a plank under her bed. 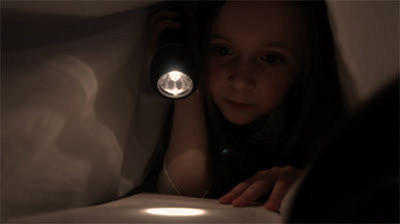 She didn’t leave her hiding place until the night fell for good and her room got pitch black. She walked on her tiptoes to the kitchen and without turning on the light she reached the glass of cold milk on the table. Next to it there was a small plate with three cookies. She drank the milk quickly, grabbed the cookies and got back in her room. Her last thought just before she fell asleep with the last half- eaten cookie on her hand was to remember to put the letter back next morning. “I thought I lived a normal life. I thought that being sad, angry and crying, hiding under a bed and being invisible to avoid trouble was part of a normal childhood. I wasn’t allowed to go out and play, I wasn’t allowed to invite friends home. I had no meter of comparison to realize that everything about my life was wrong. I soon became silent like the night. I stopped running, talking, crying; I stopped showing any emotion. I didn’t know why, what or how I was doing it; I just knew I had to avoid any kind of attention on me. At school I was sitting alone. I was afraid to get close to any of the other kids. I thought I would cause trouble if I showed that I was there. But kids are kids and maybe I preferred isolation, but soon someone found me interesting enough to get close. Her name was Mary. Now that I think of it, I believe Mary played a part to what I have become. She was a pretty little girl with shiny brown hair, a pink ribbon with a big, fluffy flower on her head. Always in light coloured dresses, always tiny white socks. She had large, brown eyes, a little cute nose and pink lips. She looked and acted like a doll. I don’t know what exactly interested her about me. I hated dresses and dolls, I didn’t talk much - well, almost not at all - and my look was often unfriendly. I usually sat down and played with pebbles, my hands were always dirty - the teacher often complained about how my hands stained my notebooks - and my nails were never clean. Still, she came to me one day with her little jumpy steps and asked me if I wanted to go to with her to her house after school to play. This idea got me so unprepared and surprised, that I remember nailing my eyes on my dirty hands, thinking about how lovely it would have been to finally have a friend. How could I go to her place with dirty hands like these and that if I don’t go home right after school I would be in serious trouble. For a few minutes I didn’t say a word. And then I decided to take the risk. I could stay just for a while and then I would run like the wind back home. Her house was only a couple blocks away from school, so it took us less than five minutes to get there. That was even better for me; I could stay a bit longer. She lived in a normal block of flats, just like I did; nothing much different and we were walking all relaxed, smiling, talking and for the first time I was …maybe happy. I don’t remember what we were talking about. I suppose silly girly things - although not much of a “girly” girl myself - still I was chitty chatting with Mary when she rang the doorbell of the apartment. The door opened and shock hit me like a huge, cold wave. I couldn’t move. It sounds sad and funny at the same time, now that I think of it, but you must understand Jinny love, that I was just 7 years-old and seeing a beautiful, smiling mother with a sunny face having her arms spread to catch her little girl as she ran towards her, laughing and screaming with joy, spinning her around and kissing her like she hadn’t seen her for years, slapped me on the face and took my breath at once. I stood right there like I was nailed on the ground, my arms on my sides like sticks, my mouth stupidly open, my eyes wide as plates. That shocked I was. Mary pulled me by my hand inside and her mother leaned down and welcomed me at her home; still her bright, sunny face and her big smile and I felt so ashamed for a moment and then I just forgot who I was. I started trying to act cute and pettily, I bet I looked totally stupid with my messy hair, my dusty pants and dirty hands like a gamin. But I was so overwhelmed by all of this joy and light in that house that I just couldn’t control it. We went to her room and I was shocked for the second time. Mary had a princess’ room. Light purple and pink walls, white furniture, thick pink carpet, dolls, toys, fairies on the curtains, colourful notebooks and fluffy pillows, all in glitter. The contrast was day and night; My room with the old carpet, the dark brown bed, the old scratched desk with the creaky chair, the single globe of yellowish light. I loved my room Jinny, I really did. It was my room, the only room I knew so far, with my own special, hiding place. I even loved my home and my parents too. I thought that was life, that’s how it was to be a kid; until I followed Mary at her place that day. Everything I knew, my whole world shattered into pieces. That’s when for the first time I felt that something was seriously wrong about my life and my family; something was really wrong”.